Today I found a goldmine for button lovers. The boutique is called "Knapplådan" ( wich means "the box of buttons") and is situated in a residential area in Uppsala. If you ever come to Uppsala, go there. There are buttons in every shape, material and color you can imagine! Besides the butons they also have a great selection of pure button hole silk and ordinary sewing silk. They also have some buckles and a nice selction of ribbons. And the lady who runs the place is super nice! I will definately return to that place again. The spools is button hole silk in two diffrent shades of blue. The palest is for making the loops for buttons in my stomacher and the darker one is for the embroidery on my pocket. I plan to try to cover the wood button with fabric, if it works I will go back and buy more. 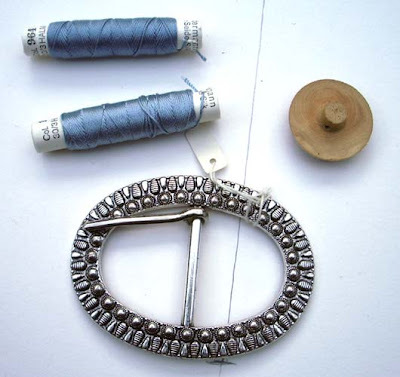 The buckle will be one of several decorations on my tricorn that I'm planning, but more on that in a separate post.